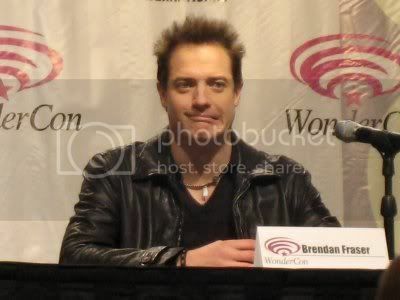 Brendan Fraser appeared at at a Q&A at WonderCon on Friday to shill for Journey to the Center of the Earth 3D and to wow the audience with his bizarre behavior and loose grip on basic mathematical concepts. No explanation was offered for his bug-eyed antics and often laborious, meandering tangents, but many chalked up the episode to the influence of powerful cold medication. I mean, I assume it was cold medication. It sure wasn’t a bad dose of Propecia making him behave so strangely. If you know what I’m sayin’. I think Gods and Monsters was an important movie. I also think The Quiet American was an important movie. Ok. Yeah. Methinks you should consider switching up your medication to a dose of humility filled with Airheads, laced with Bedazzled, and washed down with some Dudley Do-Right. Ok, Encino Man? Christ. But those two gems were just a warm-up for the main event of What the hell is he talking about? That’s right: Fraser’s cold has swelled his head to a point where he thinks that George of the Jungle is an honest-to-Jesus pop culture phenomenon. Sure. Right up there with the Flowbee. I publicly apologize for Monkeybone. In case you were wondering… no, no one else got the, uh… joke. I think it’s fair to say everyone in attendance was too preoccupied with their concern over his mental health. Ha! Thank you, Brendan Fraser, talented elocutionist and ninja mathematician. I wonder if these bizarre “star” performances are really just a product of being at WonderCon in the first place. That is, maybe these guys go back home and tell stories about their crazy antics in front of the geek crowd. Perhaps before facing the crowd of nerds and geeks who he knew were going to ask him a bunch of obnoxious stupid questions, he sat crying in the back room drinking Jose Cuervo straight from the bottle until his poorly recompensed appearance at WonderCon was called. I mean, you gotta feel for the guy. WonderCon? I had great hopes for that man. C’mon, Nathan. We both know he’s not that good of an actor. He was genuinely either a) naturally not that bright or 2) drugged up. Of course, Karen cites a perfectly believable third possible scenario. I was at that panel and I think that Brendan was high…..maybe off of his own hair products……. I would agree with Karen above if this was ten years ago that he was at Wondercon, but nowadays bigger celebrities are showing up all the time at the two California comic-cons to promote their films. Edward Norton, Gerard Butler, Hilary Swank, etc. in person. Even Steven Spielberg and Harrison Ford have done via sattellite blab for their upcoming film. Anyway, Brendan’s weird rambling wasn’t helped by his freaky hairdo/hairplugs (?) he had going on either…. Hopefully he’ll get it together. C’mon guys, cut the dude some slack. I saw him in person a few days ago and he was perfectly fine, perfectly coherent, and despite being incredibly tired from being run ragged doing press for the new releases, he was actually very sweet, genuine, and humble, as well as self deprecating (I got the opportunity to talk to him – it seems he gets slightly uncomfortable answering questions to big crowds/interviewers, but when he talks to his fans or one on one he’s a different person.) He might be a bit quirky, but he’s a good guy. Every single person I’ve talked to that has met him in person has said the same thing. Oh, and anyone who’s seen Gods and Monsters or School Ties knows that Brendan can indeed act quite well. He’s actually got one of the more diverse careers in Hollywood. Think about it, he’s done indie films (Gods and Monsters, Crash), drama (School Ties, With Honors), offbeat films (Monkeybone), romantic comedies (Blast from the Past, Mrs. Winterbourne), comedies (Encino Man, Airheads), Kids films (George of the Jungle, Dudley Do Right), big budget action adventure (The Mummy movies)… he’s pretty much done it all. I for one think he’s an underrated actor. Jess be smoking the same thing heebee smoking.